Bespoke Virtual Gastric Band Training Sessions - Sandy Robson Licensed by Sheila Granger. Bespoke Virtual Gastric Band Training. One-to-One Sessions in Harley Street. Bespoke Virtual Gastric Band trainings are a great way to learn the programme. I think as professional therapists we have all spent precious weekends cosseted up in seminar rooms learning the skills of our trade. We have endured hot rooms, cold rooms, to downright freezing. I remember being on a training seminar in the midst of winter, in a basement room and the air conditioning was on full blast, the manager was nowhere to be found and it wasn’t until the afternoon that it was switched off. After recovering from the frost bite, I was able to settle in and enjoy my learning experience. However, needless to say, I was not a happy trainee! A few months later I attended yet another weekend seminar, and the management failed to mention that every Sunday afternoon in the adjacent room, was a Salsa class. Trying to learn new information with a pounding salsa beat in the background was extremely challenging. The day was an absolute farce. With all the preparation in the world, sometimes it is impossible to create a learning environment conducive to all our needs and requirements, life steps in and creates situations where we have no control. Consequently I was inspired to conduct Bespoke Virtual Gastric Band Training sessions that take the stress out of learning. I’m offering one-to-one training sessions from my Harley Street office that can be tailored to suit you and your busy life. With an individual approach, the programme can be learned within a day in comfortable surroundings, and you can go away with everything you need to deliver a professional and effective weight-loss programme to your clients. The Virtual Gastric Band has undergone clinical trials and has a 95% success rate; it has enriched my business considerably and I am sure it will do the same for you. Not only does it offer a viable option to clients who have run the gamut when it comes to diets, but it also gives our obese clients something that can literally save their lives. Bespoke Virtual Gastric Band Training sessions are conducted Friday, Saturday and Sunday. Not only is it a more relaxing, attentive and stress-free learning environment, but the times are convenient too. For instance we can start on Saturday at noon, and finish around six, or Friday evening and Saturday morning. I am fully licensed by Sheila Granger, the pioneer of the Virtual Gastric Band to offer the trainings to professional therapists. Please email me for further details and available dates. 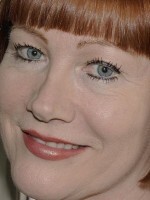 Sandy Robson is a fully qualified Hypnotherapist and NLP Practitioner; she trained with the Contemporary College of Therapeutic Studies and the Erickson Hypnosis School, London. She specializes in Weight Loss and Self Esteem related issues, including emotional, physical and sexual abuse. Pregnancy and life lessons as a parent Hypnotherapy - Will I cluck like a chicken?